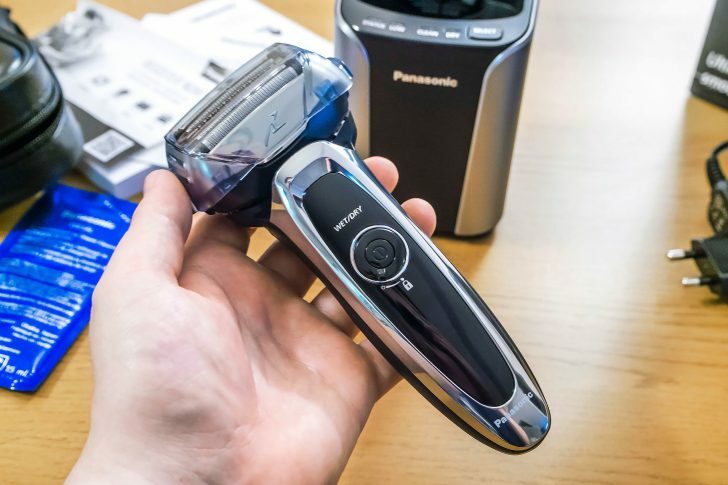 I have to be honest, I had no idea Panasonic did razors until now. Or at least I did but they were just in the back corners of my mind. Despite over the years owning countless of their TV’s, music players and cameras, they’re not a company I’d ever associated as being a big player in the beauty and grooming sector vs. the likes of Philips and Braun etc. I used to be mad on Panasonic’s Japanese CM commercials because they all starred Ayumi Hamasaki, a JPOP artist I continue to a super-fan of and have been since I was 12/13. I also did, if you haven’t already read me mentioning, Japanese up to and part of my undergraduate. Here’s a playlist of some of those ads, they’re worth a watch even just for the cool gadgets we never really got to see here in Europe. So this was a surprise. I can tell you before you read the rest of this article, this is the best razor I have ever used – no hyperbole, no drama – the best. From it’s build quality, design, functions and features – it’s ingenious. Also, Panasonic didn’t give me this as part of any campaign or launch or what-have-you, but just to let me see what they’re doing and hoping I might like it. 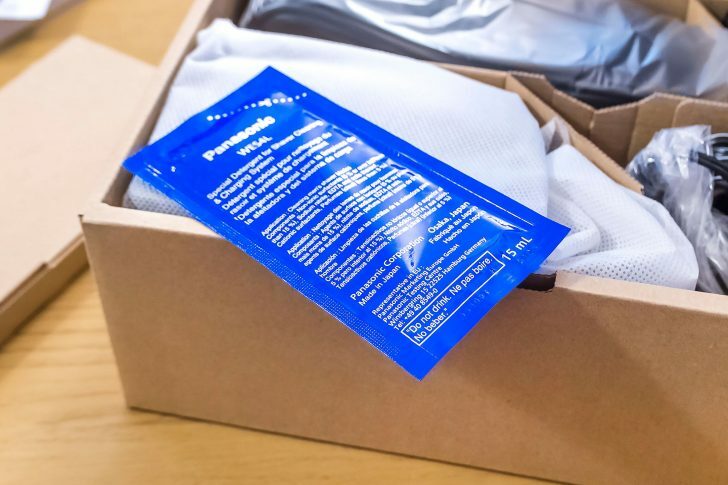 Before getting into the meat of the unboxing, I had to mention the automatic shaving sensor. 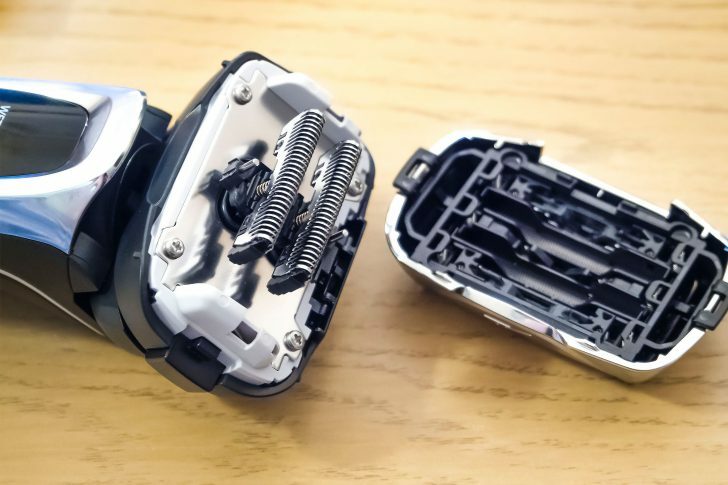 This is the coolest feature of any razor, ever. Pushing the on button once activates the razor with Shaving Sensor. 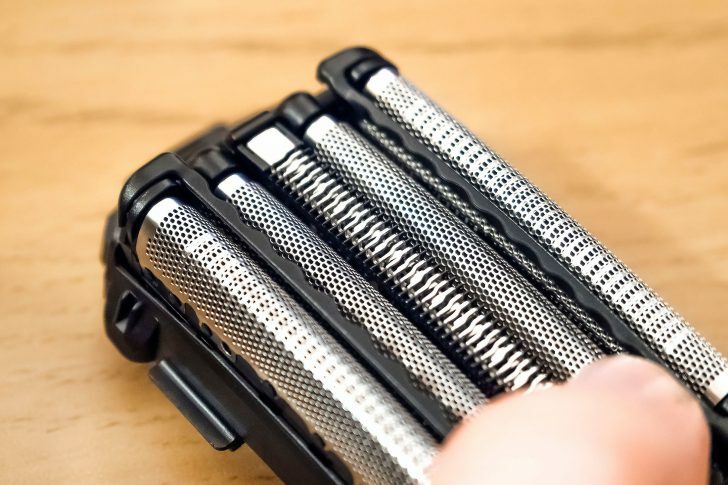 The razor senses beard thickness and adjusts its power automatically so as not to overly shave finer hair (thus damaging the skin) and then provide enough power to remove thicker hair without tugging. This feature is not a gimmick and really, really works. 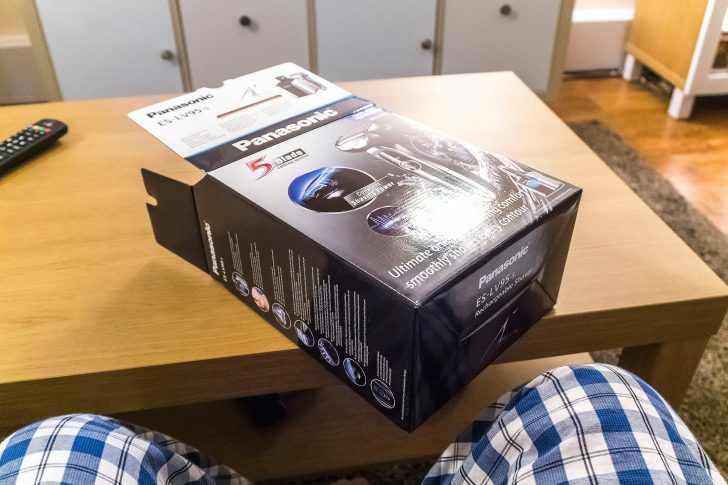 The Lamdash (Panasonic’s shaver brand) has been sitting on my to-do pile of products for a few weeks now and last night, as I was in my pyjamas watching the abysmal World War Z on Netflix (for the millionth time), I thought I’d crack it open. You get a nice big, weighty box that when you open is just filled to the brim with stuff. This is the ultimate package for guys as there’s so much to look at, play with and is like opening a present on Christmas morning. It immediately felt gadgety and techy which set me buzzing. 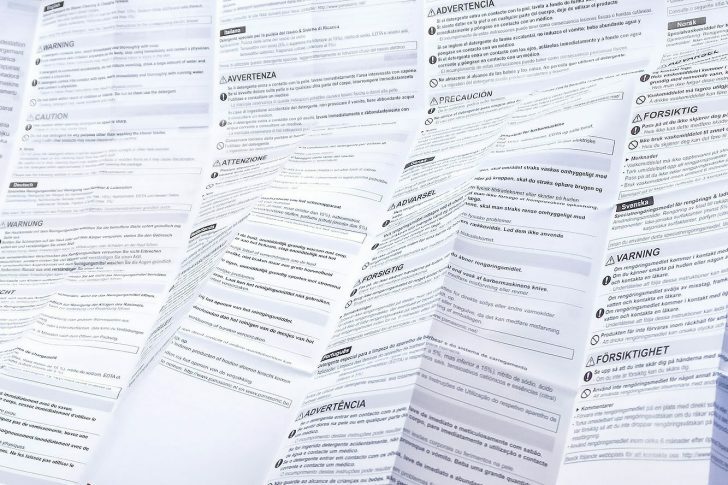 The manual is weighty with 17 languages. One of the biggest product manuals I’ve ever seen! 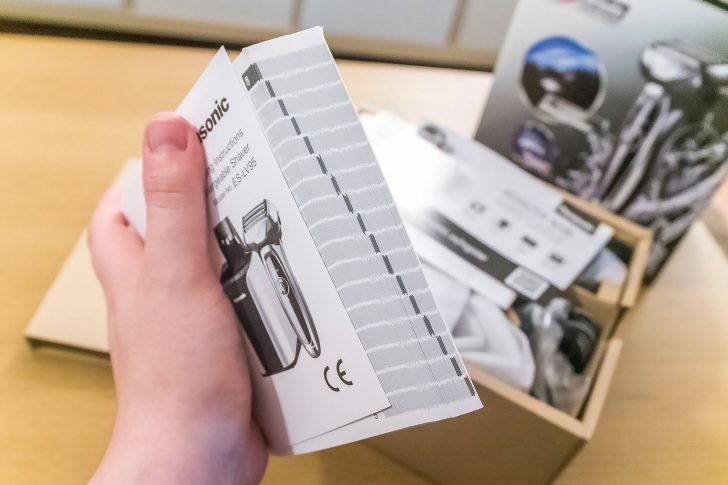 But don’t ignore it; this is the only downside to the shaver – you do need to read the manual as it isn’t the most intuitive in the world, however you only need the first 25 pages that are in English and it’s worth it. 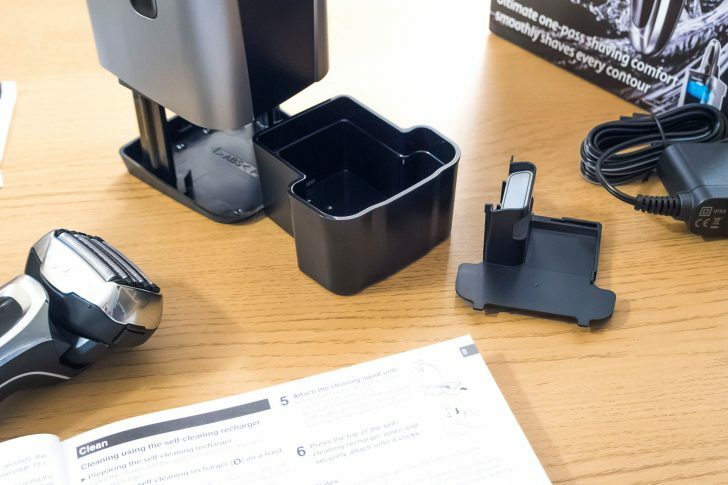 Included are a blade lubricating oil and an enormous two-pin plug which can be plugged either into the cleaning station or directly into the shaver. Watch out for this. Mine was tucked away, almost missed in the lining of the box. If I wasn’t looking for it, I wouldn’t have found it. 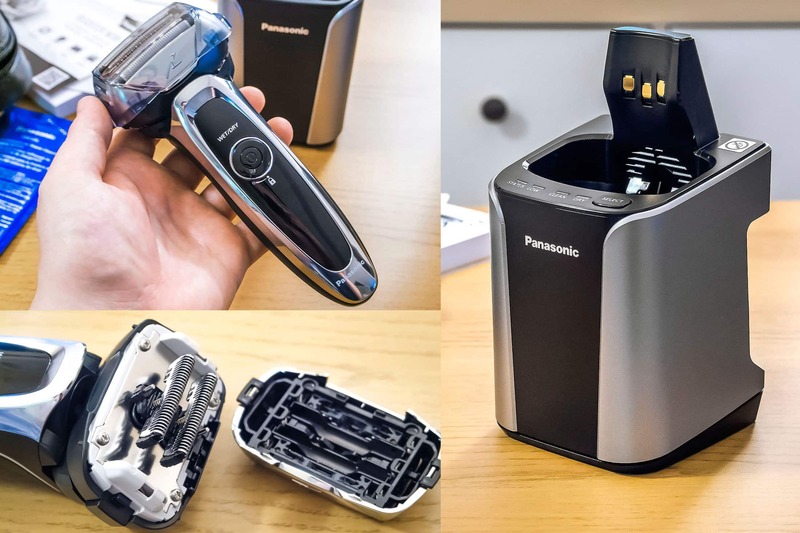 Like most shaver cleansing systems, the Panasonic ES-LV95 uses a propitiatory detergent. It took me a little time to search but can be found here at shavers.co.uk for £11 or here on Amazon (plus there’s some non-branded versions). The cleaning solutions comes with the most hilariously large manual; the size of my entire coffee table. 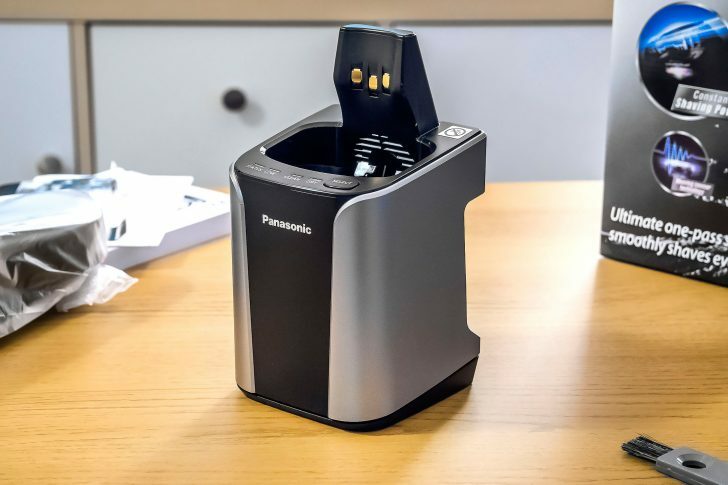 The Panasonic detergents are much, much better than other brand’s as you mix them with tap water in the tray rather than having to buy and store big bottles like Philips or cartridges like the Braun Clean and Renew below. Plus I have dropped one of the Braun cartridges on my tiled bathroom floor which proceeded to explode – they’re not cheap either! The coolest looking cleansing system I’ve come across so far. I think it looks like a teeny-tiny rice maker and although made of plastic, is very, very sturdy. When you pop the big button on the side to get to the tray, hold the device as you do it otherwise because of it’s very tight spring, it does jump up in the air. Inside you’ll find the tray and filter inside that. This is where you fill the water and squeeze in the detergent. 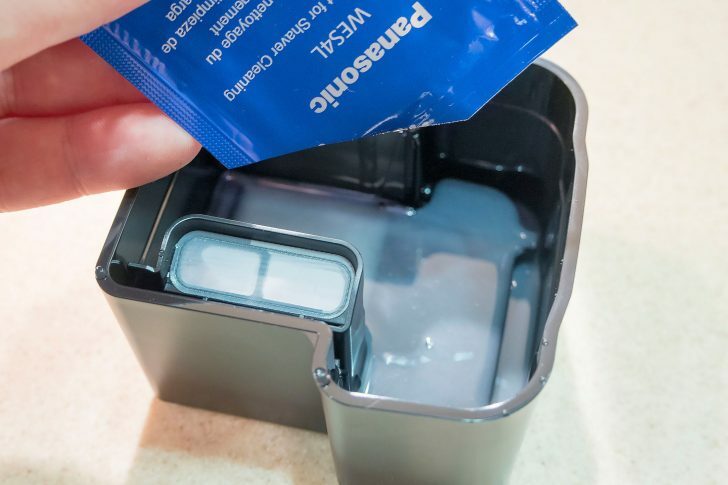 When you do, put the detergent liquid in first and then use tap water to fill no further than the line (otherwise it might spill/leak). Panasonic ES-LV95-S has a huge head. Weight is evenly distributed and comfortable to hold. 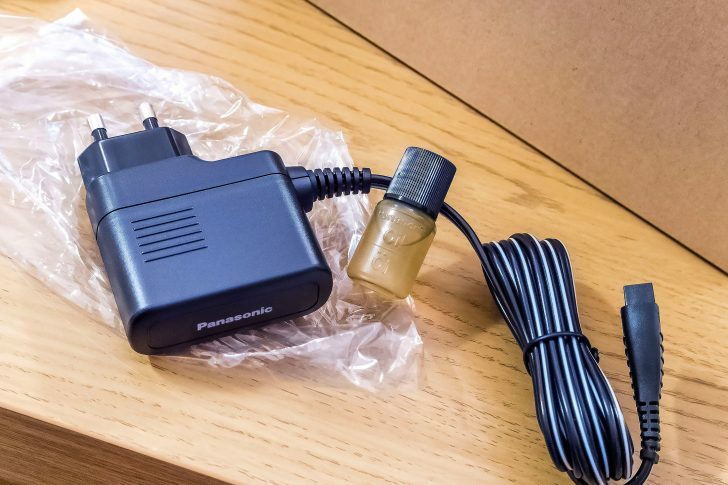 So here it is – the Panasonic Lamdash ES-LV95-S. 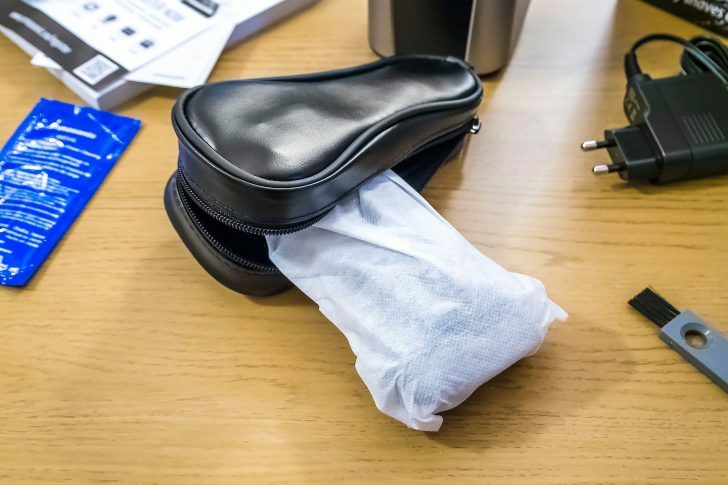 It comes already wrapped up inside a leatherette pouch and is completely discharged. There’s a little slider by the power button to prevent it switching on by accident. As a side story, an old Philips razor of mine used to do that a lot. When I was on a train the Kings Cross a couple of years ago, I had my headphones on, my bag next to me and somehow it had set itself going. The woman sat accross from me got my attention by staring me dead in the eyes. I removed my headphones to hear the suspicious buzzing noise in my bag, rushing inside it and waving it around and said “Oh dear, yes look my RAZOR has turned on. Silly RAZOR”. So yeah, thanks for the lock button Panasonic – appreciated. There’s a 5 blade cutting system and the head is entirely replaceable if and when needed (they last for a good couple of years. the same as any electric shaver). There’s a combination of lift foils, slid blades and finishing foils to give a great shave from start to finish. 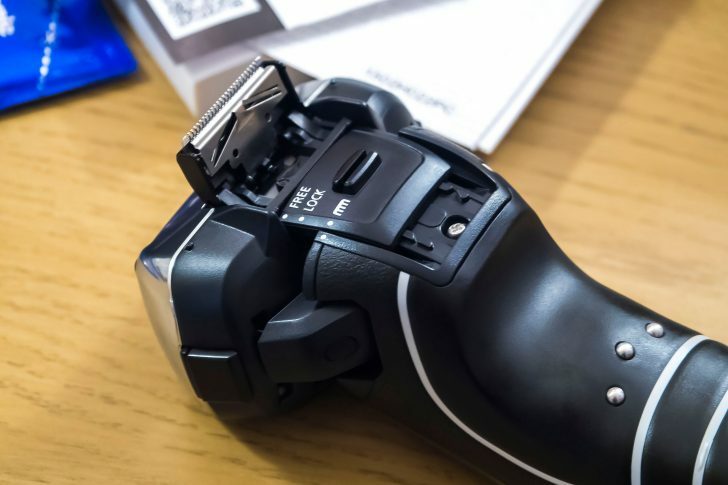 The shaving sensor technology (when enabled) adjusts the power to the blades depending of the thickness of hair it detects. The head is massive and one of the most flexible floating heads I’ve come across. Below is a little video just so you can see how air-smooth this is! Panasonic ES-LV95-S with head removed. The other 2 blades are inside the removed head. Each of the 5 foils is separately flexible, coupled with the ultra-positionable head, makes for the most face-forming shave possible. The shave is incredible either wet or dry. It feels like absolutely nothing against the skin and sounds like one of those rainmaker sticks from primary school as it lifts and slices the hair. It gives an incredibly close shave! It worked really well with the new TOM FORD For Men shave oil too that’ll be coming into stores at the beginning of June. Be careful. Because of not being able to feel a thing whilst shaving, it’s easy to forget that there are 5 blades on the go against the skin. Although it gives really good one-pass shaving, I did get a bit carried away in a couple of areas and made myself a little raw – totally my own fault. 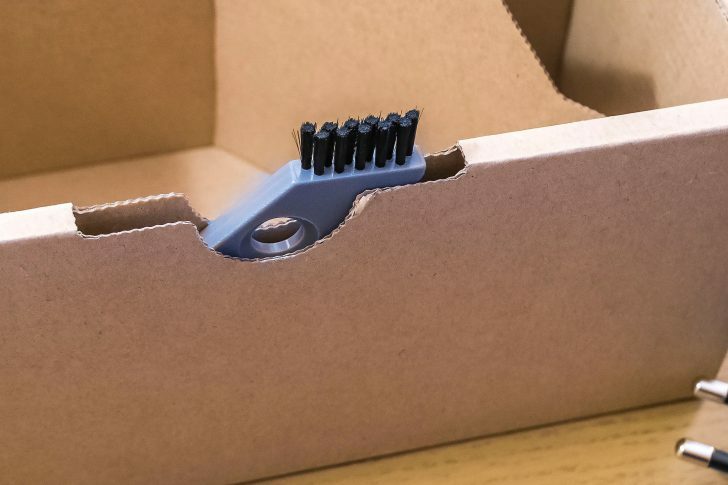 Finally on the back you can set the head from floating to fixed and then pop up the back trimmer (this is very sharp so do watch yourself – this isn’t a cheap piece of kit! 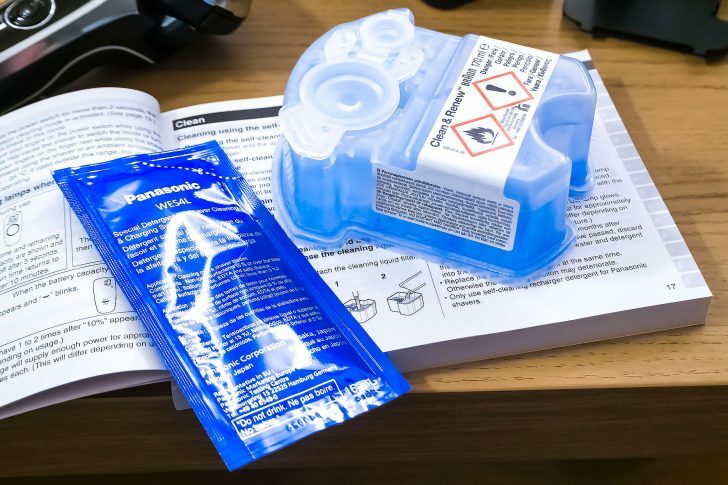 When you plug it in, you just select the mode (cleanse or dry – cleanse leads onto dry but if you’ve used a wet shave, you can just dry it out). Then leave it to do its thing. Now, I was going to say how quiet it was, particularly in comparison to the Philips and Braun cleansing systems I’ve used before. However, this is a trick, a very nasty trick. After a few minutes, there’s then the most annoying buzz from the razor as it activates with the cleansing system, it kind of beeps/buzzes like a mobile phone on vibrate against a hard surface. All I can say is put this onto clean before you leave the house on a morning. I had recorded the sound, or so I thought, but had omitted to turn the microphone on. However, here is the cool light show you get once turning the razor on and showing how simple it is to set the process going. The razor comes out perfectly dry and ready to use/transport once the cycle has finished and also on a full charge. With something like this that you’ll buy once and will last for years, I’ve tried to be as comprehensive as possible. I love it, it’s seriously replacing my Braun for the time being, purely that it gives a better shave! 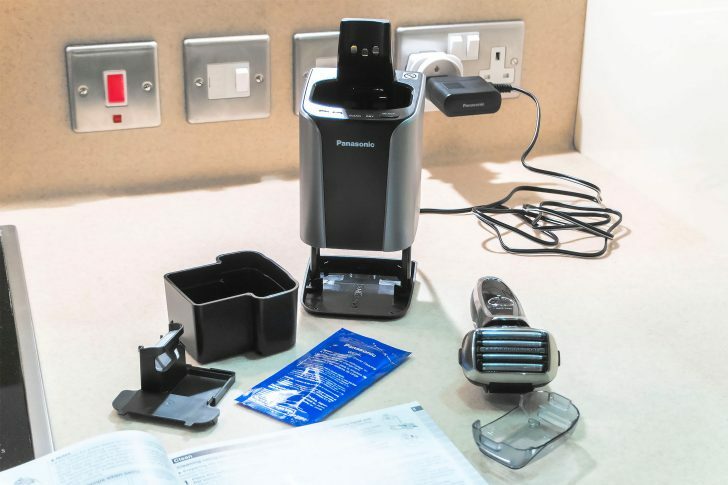 I am now totally focused on what Panasonic will be doing next in terms of grooming and beauty products – I hope they can somehow make more of an impact on the scene though. Maybe this is just a marketing/advertising thing because the product definitely brings it but in an industry so saturated with almost indistinguishable differences in technology, it’s hard for the true winners to rise to the top. 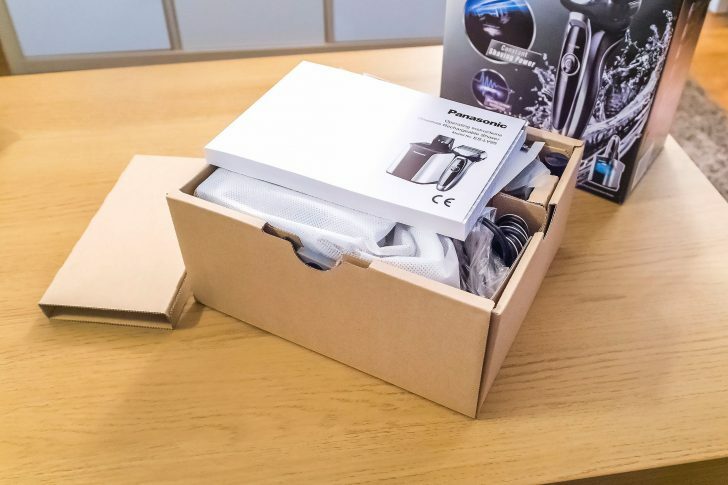 The Panasonic ES-LV95-S is available here on Amazon for £189 down from £329 or here from shavers.co.uk for £174.99 (never shopped with them before so some feedback from anyone who has would be great). This article first appeared on MANFACE written by Thom Watson. It was published on Wednesday 4th May 2016 and was last updated on Monday 3rd April 2017 at 1:00pm. It's categorised under Gadgets, Shave where you'll find more related content.